Food Costs > How Much Does a Crawfish Cost? How Much Does a Crawfish Cost? Crawfish has the texture and flavor similar to shrimp but the look of a very small lobster. Also known as crayfish, these crustaceans are often used in place of shrimp in different recipes. However, its distinctive flavor separates them from other seafood. How much do crawfish cost per pound? It is hard to offer the exact price for crawfish since, like any other seafood, the prices for these crustaceans rise and fall almost every week. These prices can even fluctuate on a daily basis in some areas, just like the stock market. However, most crawfish are sold per pound or by the sack, and the usual price per pound falls between $3 and $6 per pound, depending on the nationwide supply and the factors mentioned below. HEB, a popular grocery store chain, offers crawfish for close to $3 per pound. The Times-Picayune, based in New Orleans, Louisana, broke down the costs locally and had found most boiled crawfish in the New Orleans area averaged about $4.59 per pound. Crawfish.com tracks the average price of crawfish per pound over the years. In 2015, the average price of boiled crawfish was $5.74 per pound, whereas, in 2016, the average price was $5.46. As of this writing, in 2017, the average price was about $5.04 per pound. On Amazon.com, some retailers sell live crawfish for a much heftier price around $14 to $20 per pound. Like any other type of seafood, the price for crawfish is determined by the supply, which is in turn influenced by the season and even the weather, according to Nola.com. It is known that crawfish prices are subject to change as the season progresses due to weather and availability conditions. Crawfish prices are the lowest during the spring and summer months and will peak from April to June. CajunCrawfish.com says there are three factors that determine the start of crawfish season: when they are readily available, they are cheap enough to afford and they are big enough to consume/enjoy. If you’re near the coastal states, such as Texas or Louisana, you’re going to pay much less than a state a thousand miles away. In comparison to other businesses, crawfish prices vary as they are only determined by suppliers. Some suppliers charge a bit higher compared to others. This competition keeps the prices lower for the consumer. As mentioned, the crawfish is sold per pound or by the sack/package, either live, frozen or boiled. Basically, the crawfish will be weighed and you will get what you have paid for. No other inclusions will be given. If buying locally, especially in a state where crawfish are harvested, then there’s a good chance they will be wild caught, but in some cases, if buying online, they may come from a farm. An ethical company will always tell you the source of crawfish before you make your purchase. If you were to purchase your crawfish online, shipping fees will more than likely apply due to the sensitivity of the shipment. Be prepared to spend close to $30 to $50 for expanded shipping. 99 percent of the time, you will need separate ingredients to create a delicious meal. This can include something as simple as lemon or butter or a crawfish boil seasoning. 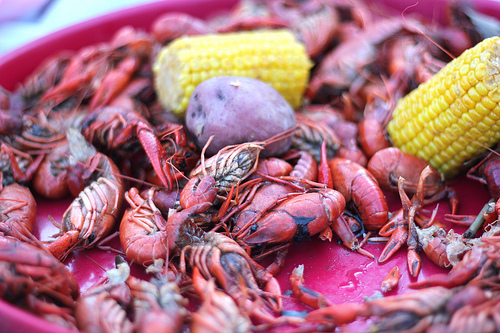 In most cases, people will boil crawfish in a large pot with seasoning, corn, potatoes and onions, and once done, all of the contents will be poured over a picnic table for everyone to enjoy. A complete crawfish boil, when you add in these ingredients, will only add another $15 to $25 to the estimates mentioned above. If you don’t have the supplies, you will need to consider a larger boiling pot, crawfish tray, wooden paddle and a styrofoam cooler to transport it from one location to another if you were to buy locally. Keep live crawfish cool and moist between 40 and 50 degrees Fahrenheit by using wet towels on top of live crawfish bags before boiling. Don’t allow them to sit in cold water for a long time as this can kill them. The same can be said about moving them from one point to another. When a crawfish is boiled, its tail will curl; however, if you notice the tail is straight, even after boiling, this simply means it was dead before you cooked. The best way to determine if it’s good to eat is to inspect the meat; if it falls apart, then you won’t want to eat it. When you want to order crawfish, it is suggested that you consider buying them live. This is to ensure that what you will get is as fresh as possible. Thus, it is a must for the suppliers to deliver the crawfish alive. Some stores have direct contacts with farmers and suppliers to make sure that your crawfish is straight from the farm. The average adult will consume five to 10 pounds. The average pound, depending on the size, will include anywhere from 15 to 20 crawfish. On average, 10 pounds of whole crawfish will yield close to 1.5 pounds of meat. What is the minimum number of pounds I can order? How fresh are your live crawfish for local delivery? How fast do you deliver? What sizes (grades) of live crawfish does your company carry? Can I buy live crawfish year round? If not, what will be the best times to purchase them? Buying in bulk, which is often in a sack of 40 to 50 pounds of crawfish, can often bring the costs down. Houstonia says if you can find live crawfish for less than $2.99 per pound, then you’re getting a good deal. As for boiled, anything less than $5.99 per pound would be considered a good deal.